Mexicali is the capital of the state of Baja California, and 2nd largest city in Baja California. It is the route between Baja California and Mainland Mexico. Hosting an interntional airport, and border crossing. Downtown near Morelos Street and Reforma Avenue is in the process of being modernized and shade structures built over the walking areas with Cathedral de Nuestra Senora de Guadalupe as the focal point. Mexicali, near the delta of the colorado river, began as a farming and agriculture center; South east of the city are many farm communities each with its own set of services; These communities are seperated by farms and connected by paved roads. North in the US is El Central also a center of agriculture. Mexicali has become today a major city with all of the venues, and entertainment centers one would expect from a metropolitan city. The city has a large number of colleges and universities, which effects the music culture in Mexicali. Rio Hardy is a natural attraction during summer months; Hosting undeveloped activities of camping, jet ski and motor boating, fishing, and exploration. Within the delta is a Cucapah Indian Reservation; Rancho San Pedro y Campo Camerina. 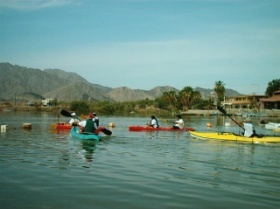 The deserts, sand dunes, and Laguna Salada attracts many off roading activites into the Mexicali area. As well as a new sport of sandboarding. Has their races centered around Mexicali. They have a series of 6 races. Mercado de Refacciones Gran Prix, Ladies Race, (A womens race for breast cancer awareness), A Night Race, Jacume Gran Prix, Mexican Logistics 300, and Race Ready 275. Their races are international but also with considerable talent from local Baja California racers, and are known for being friendly and enjoyable. The race is international. Their first race was in 1967 with a 1000 mile race down Baja California placing Baja California on the map for off road racing. Their races are called the funnest on the world and have a vintage class for trophy vehicles which adds flavor to the legends created out of Baja's off road races. The Mexican 1000 is their iconic race, which takes place yearly. In 2013 they added Mexican 500 to their Baja race circuit. Rumors of a 2000 mile baja loop race have been presistant. The Mint 400’s “Show N’ Shine,” in Las Vegas, is a good opportunity to look at the list of famous off-road vehicles, which may be in the Mexican 1000. There are many hot springs and health spas in and around Mexicali area. One scenic destination would be Guadalupe Canyon where water that has seeped through mountains has been heated and mineralized and emerges into an oasis in the canyon. The canyon has been made accessable to people who want to camp next to their own private springs. Located 40 Miles south west of Mexicali.